It was not the first time Wimbledon had dissolved into a chorus 'oohs' and 'aahs' at the brilliance of Roger Federer but the Swiss ringmaster almost outdid himself when he flashed his racquet between his legs to lob Sam Querrey on Thursday. That individual moment of magic came midway through the second set of a 6-4, 6-2, 6-2 second-round victory and summed up an effortlessly brilliant demolition job from Federer, whose bid for an eighth Wimbledon title took an impressive step forwards. To Querrey's credit he made a fight of the early stages, before mentally ceding the contest as Federer took control. While not given the greatest test, Federer took the chance to rehearse his repertoire of stunning groundstrokes, breaking for a 5-4 lead with a scorching backhand crosscourt pass. Having clinched the first set, he stepped on the gas, immediately breaking again at the start of the second before bringing out the party piece while leading 4-2. With Querrey a fraction under two meters tall, any sort of successful lob would have been impressive. Federer, however, was on the run when Querrey's mis-hit putaway allowed him a split second to re-adjust and flick his racquet through his legs, and he arced the ball back over the American's head and sending him scrambling back to the baseline. Querrey referred to Federer's "aura" and perhaps befitting the supernatural adjective, the Swiss described the congested thought processes of that split second before he attempted the shot. "He's got that aura around him. You know, today he hit that shot between the legs," Querrey said. "He hit some amazing shots. You want to go over and give him a high-five sometimes, but you can't do that." 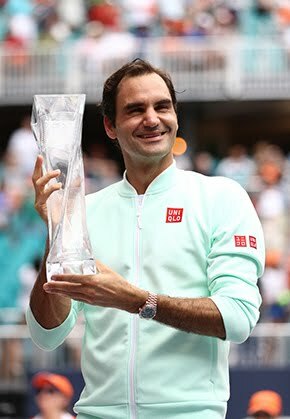 Federer was both amused and pleased when told of the American's reaction to his moment of magic. "He said that?" Federer laughed. "Okay, That's cool. "Why not, he can do it. I'm happy to do it, too, you know!" "Sam's a super laid-back, nice guy. I really like him a lot. When we look at each other, I feel like we know when somebody hit a good shot." "I guess so many things shoot through your mind like, what's the score? Love‑30, I wouldn't have hit a shot like that, no chance. "But then I was like I feel better almost shuffling my feet and giving myself, with the right grip, without changing that anymore, to hitting a lob. "Easiest way for me was somehow through the legs rather than coming to a complete standstill and then hitting a lob, which he would have seen where it was going to go." The 17-time Grand Slam champion, who last won Wimbledon in 2012, faces Australia's Sam Groth for a place in the last 16 and is growing more confident with each match. "I think it's possible. But then again, many players are playing well. Andy Murray is playing better than he was last year. 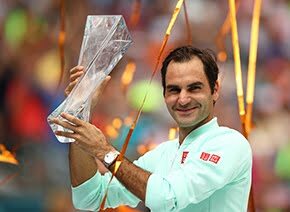 Clearly it's not going to get easier," Federer said. "At the same time, when my game's going well, at the level I'm playing this week, I feel there's a good chance for me."